Field trips can be such an exciting and integral part of any homeschool. They make learning come alive. If you are looking for a way to record and have more memories of your field trips, you should certainly consider the Exploring Creation Field Trip Journal from the respected Apologia Educational Ministries. The journal is a way for students to record their experiences on field trips, and it can help capture both the educational value and the memories made on special outings. The Field Trip Journal ($22) is a standard size spiral bound notebook on thick high quality paper. It has a beautiful scrapbook-style design on all of the pages. You can download some great sample pages to see the fun and colorful layout of the journal. I decided we would use it as a family journal, so the kids could enjoy it together. The journal is not just about recording field trips though, and since we just didn't get to use it specifically for field trips like I'd planned, I want to show some of the other ways it can be used to record family memories. When you first open the book it offers several suggestions for field trips, along with a web address with even more ideas for locating field trip opportunities and making the most of field trips. The suggestions really helped me to think outside the box. For my 8 year old that is interested in antiques, I was inspired to look beyond traditional museums and jot down the radio museum, antique stores and a local restaurant known for its eclectic array of "memorabilia" as ideas for him. My husband, the Civil War buff, had fun brainstorming ideas for the local Civil War field trips to go with an upcoming summer study we're planning. It will also be great for when we utilize our membership to the aquarium. Some of the other sections include Preparing for a Field Trip (which is full of helpful tips for the parent/teacher), Places I've Explored Maps, My Special Spot Pages, and As I See It Pages. The Places I've Explored Maps include layouts where you can list/map your travels in your state, around the US, and across the world. This is a good way to reminiscence about trips we've taken. 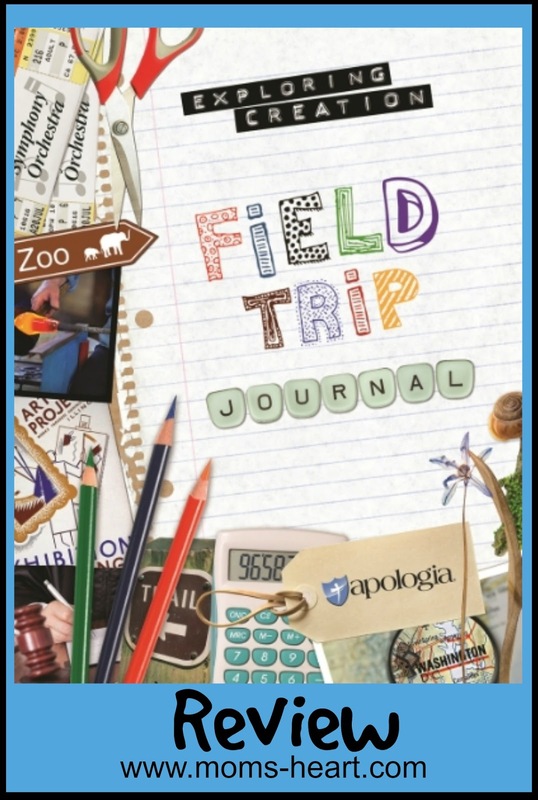 The heart of the journal is the field trip section. The specific field trip pages are in two-page layouts, and there are enough for 10 field trips. If you take a lot of field trips every year, you'll probably need more than one journal. The layout includes a place for a picture and map, an emergency contact plan, a space to list books read, and a couple writing prompts about things the student wants to see or things they don't want to forget. The only thing it doesn't include is a pocket for holding tickets or mementos, so you might have to get creative fitting them in if your kids like to hold on to those types of things. Within the journal, you'll find it made clear that field trips don't have to be expensive and time consuming. It can be as simple as a nature hike, a trip to the park to feed the ducks, or picking berries to make jam. There are several sections in the journal that lend itself well to simpler activities that can still be considered memorable outings. 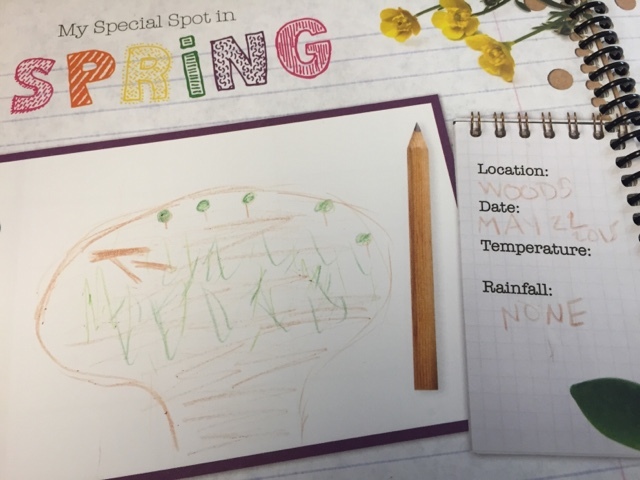 The My Special Spot and The Way I See It sections are great for nature studies. For our special spot, we are told we should choose a spot to observe and record the sights, sounds, and changes of this special spot. We are supposed to go once each season, so we can slow down and appreciate these changes. I only wish the seasons weren't labeled on each layout. The seasons are in "school calendar" order: Fall, Winter, Spring, Summer. If you follow any other schedule, or start the field trip journal at any other time of the year like we did, the seasonal studies will be slightly out of order within the journal. Leaving the seasons blank would accommodate more homeschoolers who don't follow traditional schedules, but it's not a deal-breaker either. We were instructed to find a place outdoors that is not maintained for our special spot. 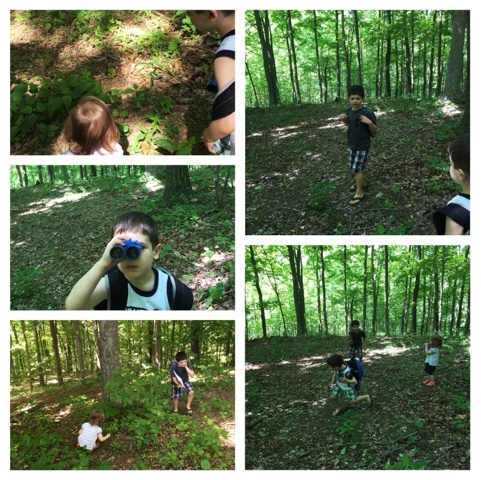 The kids have a place in the woods near our house that has a worn path and natural clearing that they like "exploring" so it worked well to use it for this purpose. The kids got so busy observing and enjoying that it was hard to get them to sit still long enough to talk about the journal, much less draw an aerial view or write notes about it. It took a little prompting to get them interested at the time, but I still think the effort it is worth it. This is Elliott's drawing with trees, sparse grass and weeds in the opening, and some fallen trees. This is a pretty journal, and is something I would have loved during my school years. The great thing about this journal is that it is intended for all ages and can be used by anyone in a fairly open-ended way. For children who like journals and scrapbooks, this is an ideal way to record their outings. For children who might be more reluctant writers, this journal has a very creative and fun vibe to it, so it shouldn't feel too much like a chore. Or, parents can still have the child narrate their thoughts, especially if it's used by multiple children. Since it's a family journal for us, I think we'll get a lot of use out of it.